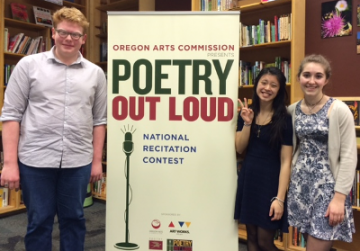 On Saturday, March 14, Willamette University once again played host to the final round of Oregon's Poetry Out Loud state competition, and P&PC was there as usual. We just can't stay away. In 2013 and 2014, we judged at the regional and state levels, and this year we judged at the regional level and then helped to convene a pre-competition luncheon discussion at W.U. along with last year's state winner Rosie Reyes, who came back from Oregon State University (where she is now a student) to share some poetry and her experiences representing Oregon at the national level in D.C. the past two years. 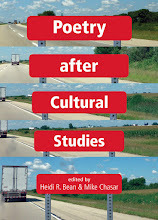 We swapped stories about reading, memorizing, and reciting poems. We recited some poems. And we nibbled at our sandwiches over the protests of the butterflies fluttering in all of our stomachs. This year, nine students from around the state— Gypsy Prince, Mitchell Lenneville, Sarah Dom- browsky, Jessica Nguyen, Anna Smiley, Atya-Sha Van Ness, Serena Morgan, Allegra Thatcher, and Riley Knowles—represented their regions as winners at the classroom, school, and regional levels. While final numbers for 2015 aren't yet in, the numbers from 2014 suggest that those nine are the tip of a very big iceberg. 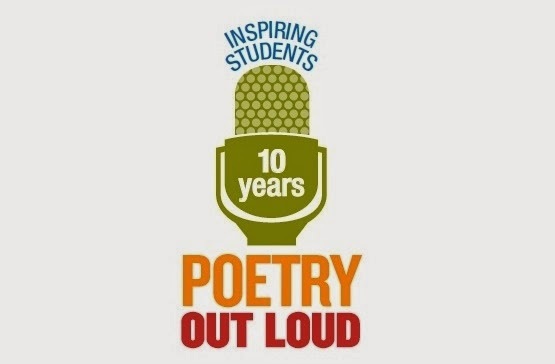 In 2014, more than 365,000 students, 2,300 schools, and 8,800 teachers participated in Poetry Out Loud nationwide, making the contest—now celebrating its tenth year—one of the most successful poetry outreach programs we can think of. 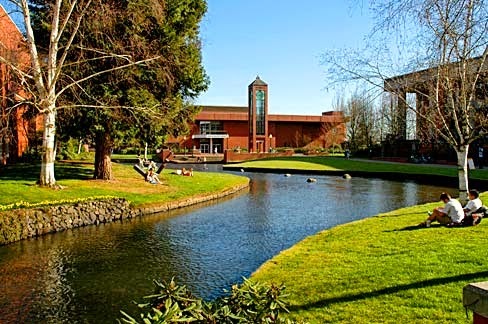 We're in awe at what the Poetry Foundation, the National Endowment for the Arts, and state and local arts agencies like the Oregon Arts Commission have managed to make happen in the past decade. Tell your Congressional representatives to keep funding to the NEA flowing so that programs like this one keep going on! This year, the Hatfield Room of W.U. 's Library was packed with families, teachers, students, and dignitaries and celebrities including the Oregon Arts Commission's executive director Brian Rogers, several OAC commissioners, Poetry Foundation ambassador Justine Haka, and Erika Lauren Aguillar, an international exchange student at the Oregon School for the Deaf who performed her American Sign Language version of Dorothy Parker's "Love Song" during intermission. We here at P&PC loved all the performances (especially Jessica Nguyen's rendition of Robert Creeley's "For Love"), and we've no doubt that judges Laurence Overmire, Ann Peck McBride, and Marty Hughley had a heck of a time coming to a decision. And it was close, coming down to a tie breaker mechanism between Gypsy Prince of the Academy of Arts and Academics in Springfield and Riley Knowles of West Linn High School. 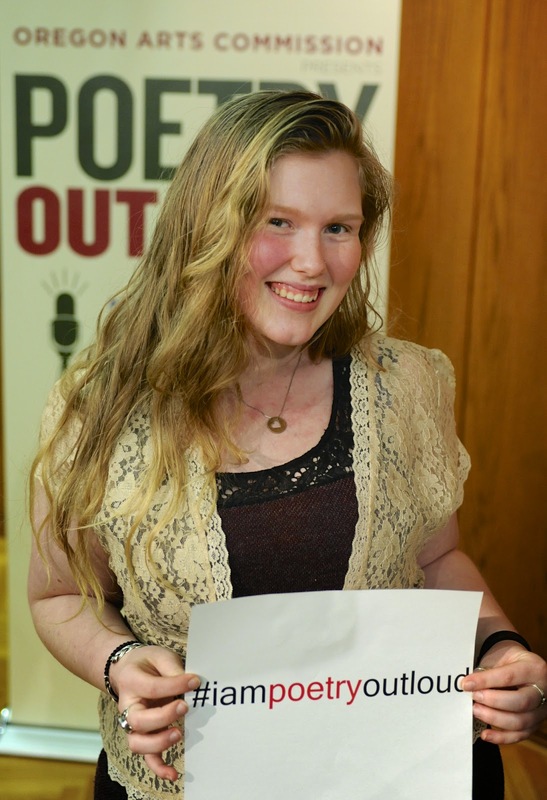 In the end, Prince (pictured here) took first place on the strength of her final poem, Gregory Djanikian's "Mrs. Caldera's House of Things," and she will represent the Beaver State at the national competition taking place April 27-29 in Washington, D.C. (Let's give a big P&PC shout-out to Prince's teacher Scott Crowell!) Prince is a three-time school champion and was one of last year's state finalists as well. She performed William Wordsworth's "I Wandered Lonely as a Cloud" in round one, Margaret Atwood's "Backdrop Addresses Cowboy," in round two, and then Djanikian's poem in round three. Knowles (no relation to Bey and pictured on the right in the photo accompanying the second paragraph above) performed Gwendolyn Brooks's "A Song in the Front Yard," Sylvia Plath's "Blackberrying," and Ernest Dowson's "April Love." As runner-up, she will represent Oregon in the event that Prince cannot. Congratulations to all of this year's competitors, and thank you to all of the students, teachers, administrators, judges, and sponsors who keep this event on our Spring calendar. We are inspired by your dedication, your abilities, and your energy—and we'll see you next year. We'll leave you with the following video in which Prince recites Djanikian's poem and in which Deborah Vaughn, the Arts Education/Poetry Out Loud Coordinator of the Oregon Arts Commission, announces the judge's final results. Happy viewing—and good luck in D.C., Gypsy!